Lighting Japan, a large lighting exhibition that recently lit up the LED and OLED arena, was a great success with more than 20,000 visitors and buyers flocking to the site. According to Reed Exhibitions, which organized the expo, the number of companies that attended the show increased by 15 percent over the previous year. GRE Alpha, which specializes in the design and manufacture of solid-state lighting power supplies and lighting control accessories, showcased its products and displayed its newest technology in LED powering systems. R&D and Design engineers from various sectors visited the exhibition to find solutions. Its products are well suited for the architectural and signage market primarily because they are installation-ready and also because the drivers are PSE Certified LED drivers. The PSE label ensures the stability and high quality of the product and materials used. GRE Alpha's 12V 24V LED Drivers enable dimming and color-changing when integrated into circuits. Japan is an important LED lighting market, with the second largest LED lighting market in the world and more than 10 exhibitions held each year exhibiting the latest global LED lighting trends and new LED lighting technologies. Its LED and laser diode (LD) technologies have gained momentum and analysts forecast that the trend is bound to continue till 2019. As LEDs work well with devices controlled by DMX and DALI protocols, GRE Alpha's DALI Dimmer module provides smooth, linear dimming with great flexibility. Its constant voltage output LED Dimming module and XLA constant current dimmable driver were showcased. In addition, the GLV constant voltage driver, the GLD-DIM dimming add-on and SLD-DIM RGBW dimming module added more color and flavor to the LED lighting set up. GRE Alpha's DALI Dimmer module provides smooth, 0-100 percent linear dimming and works flawless and efficiently with the DALI (Digital Addressable Lighting Interface) interfaces. For traditional line voltage dimming applications, GRE Alpha’s XLA and XLAV Line Voltage Dimmable LED Drivers will work with legacy type dimming systems that are controlled via phase cutting dimming technologies. LED technology appears to sync well with dimming control but it must be remembered that the integrated lamp should be back compatible with the line voltage dimmers to reduce installation costs. The XLA Series is a TRIAC/ELV Dimmable LED driver series that offers dimming compatibility and high-dimming performance. For DC type digital dimming systems GRE Alpha’s wide array of DC dimming modules offer flexibility, while providing an optimal lighting experience. Its modular approach positions it to enable high end dimming capabilities to even any non-dimmable LED Driver, without having to replace them with expensive Dimmable LED drivers. Tokyo 2020 is expected to be special as it will be for the first time in the Olympics' long history that LED lighting will be installed in a big way. The new Tokyo National Stadium and all athletic facilities will use LED lighting. This is bound to impact the market positively. Although LED commercial lighting is quite common in Japan's schools, hospitals and retail stores, its outdoor LED lighting market has considerable potential to expand. Currently the focus has been on LED standardization and making LED an affordable option- this is expected to open the market up further. The advantages of using LED lighting are many:- energy savings, reduction in lighting maintenance, uniformity in lighting, durability and the most important feature—being able to achieve various stage effects using lighting and dimming techniques. GRE Alpha is expected to play a great role in this; the company's commitment to innovation and its power conversion expertise is expected to come to the fore. It has been constantly pushing the boundaries in lighting system integration, lighting control technology and power electronics and has been able to deliver efficient, best-in-class powering solutions across a wide spectrum of industry. GRE Alpha is pleased to announce that it launched new website, as of January 1, 2016. The company is a leading provider of the best LED drivers and dimmable LED drivers. GRE Alpha is also known for its LED lighting control accessories. Some parts of the website have been completely redesigned to allow for advanced search functions, while other sections are brand new. These include the Technology Section and the Power Unleashed sections. The entire Products section has been revamped to permit advanced search functions, in order assist with matching GRE Alpha's Chip-on-board LED partners. New products for 2016 are showcased as a way of highlighting the unique functional and technological advantages of using GRE products. Visitors to the website can be inspired by the project references page, where some of the architectural projects which have utilized GRE Alpha power solutions have been used. Features such as DMX Dimming, DALI Dimming, TRIAC dimming, 0-10V dimming and 12V 24V LED Drivers and LED power supplies are displayed. For those in need of UL Listed Class 2 LED Drivers, a search will provide pertinent information about the products and specifications. On a broader scope, Smart Home Control products are available for both residential use. GRE Alpha also has a department which is devoted to Private Label, OEM and ODM manufacturing. Custom designs ensure that the customer gets what is needed by starting with basic elements and putting them together in ways that prevent over-engineering. The interactive search tool permits users to identify major categories and then to drill down through the layers until the right products is located. How to preserve light quality by selecting the right LED drivers. While LED lighting has become some of the best systems currently for improving efficiency as well as maximizing lumen control the quality of LED drivers and power supplies still needs to come along way before we can start to make real headway in the future of lighting. For high-quality output you need to have the right LED drivers for down lights and LED drivers for light panels. If you are a leading manufacturer for a business owner that needs to have full control over their lighting as well as high-efficiency lighting you need to place a focus into the LED drivers as well as the type of lights you would get for replacement. The problem with many manufacturers today is that the focus for lighting control and the production of good light is usually blamed on the bulb or the fixture. Light fixture quality and LED drivers need to improve apart from bulb quality however. While many lighting manufacturers can produce some high-quality bulbs without the right power supplies to use them we can find inherent flickering and quality issues that come as a result of an inferior quality lighting driver. On LED drivers for MR 16 manufacturers could potentially be producing lighting that is causing constant eyestrain and discomfort for anyone that has to work long conditions in lighting with improper low-quality drivers. GRE Alpha is a company that's committed to delivering high-quality drivers and lighting solutions. Our goal is to preserve overall like quality and give LED bulbs the power output that they need to improve their overall lumen control. The best quality light output is our focus and we work with industry leaders like Xicato, and Philips Lighting to produce LED power supplies that preserve quality and improve the way that LED energy efficient lighting systems manage the quality of light in any setting. GRE Alpha unveils a new approach to powering LEDs at the Hong Kong International Lighting Fair. Why buy LED drivers with integrated dimming when you could upgrade your system as you need? 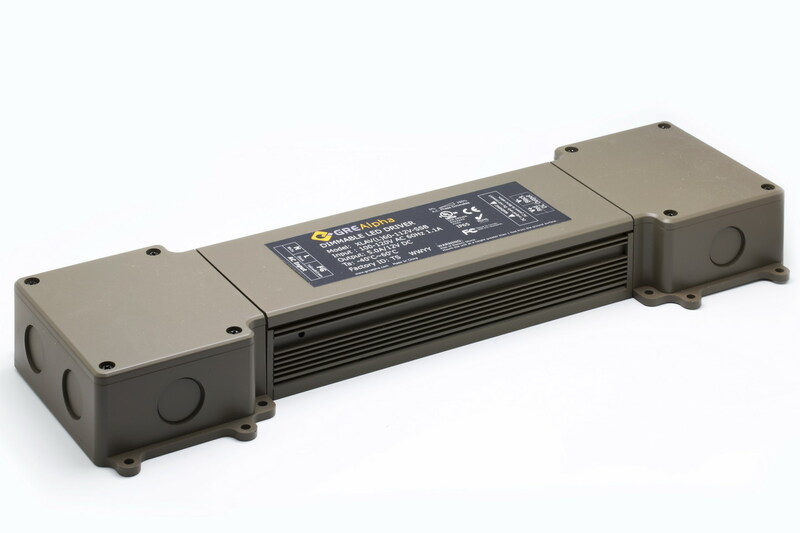 GRE Alpha revealed its newest upgradable LED driver at the Hong Kong International Lighting fair. We’d love to hear feedback from you. Please show us your support by liking our facebook page or sending us your feedback here. Other notable products showed at the fair include the world’s first and only AC line dimmable LED Driver that works with LED Lighting Strips and Linear lights and a Constant Voltage DMX Dimming module add-on with RDM support. Missed us at the show? No problem Join us next year at the International LED/OLED Exhibition in Tokyo Jan 13-15th, 2016. Book now to get complimentary show passes here. XLAV Series --The world’s first and only AC Line Voltage dimmable LED driver for linear lights and LED Strips. Worry no more about compatibility issues with existing TRIAC/ ELV dimmer switches. Our XLAV series has been tested with over 80 brand name dimmers in the market and is UL/ c UL class II Listed.